Stay tuned for a news announcement!……….. This is my Bohica Far 50 with a 30″ barrel, mil spec chamber, 16x SS scope, PRS stock, Ergo grip with palm rest, and Bohica handguards removed for that naked look. We have been priviledged to have purchased 2 BOHICA Arms FAR 50 uppers, #36 and #37. These are the 1st model uppers and these issues have all been addressed on the new model uppers. Chris has done a great job getting these 50 BMG uppers into the hands of ordinary guys like me and my dad. Below is some of the work we have done to our uppers to make them more functional to us. 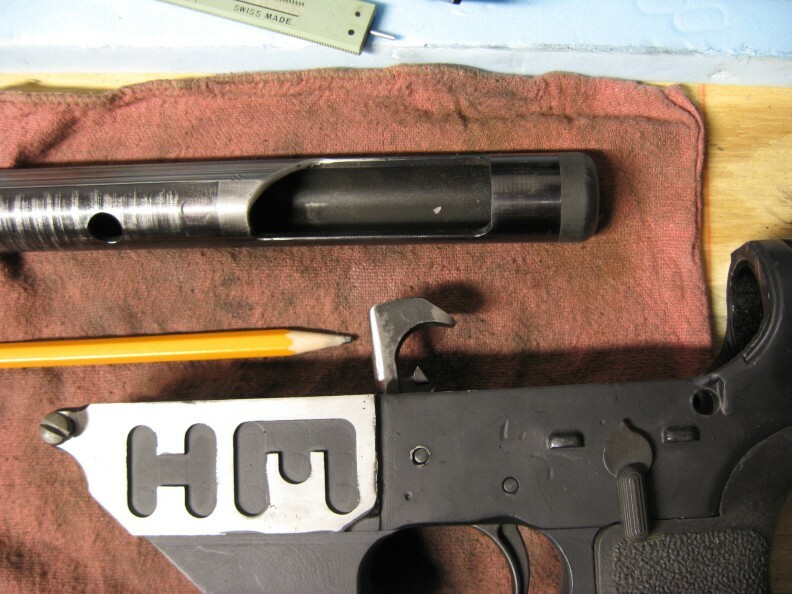 WARNING: When you get your upper I would suggest that you inspect if very carefully, read the manual, look at the parts break down, CLEAN the upper THOUROUGHLY, and fully understand how the upper interfaces and functions with your lower, especially how the bolt cams the hammer back. The following modifications are for my purposes and intended for informational use only. This information is only worth what you paid for it and use it at your own risk. These are follow up pictures by request of fellow owners. I did all the work before I mounted the scope and put the lower together. I use DPMS lower parts kits. The trigger slot on the BOHICA upper is .310″ wide on the 1st generation model. 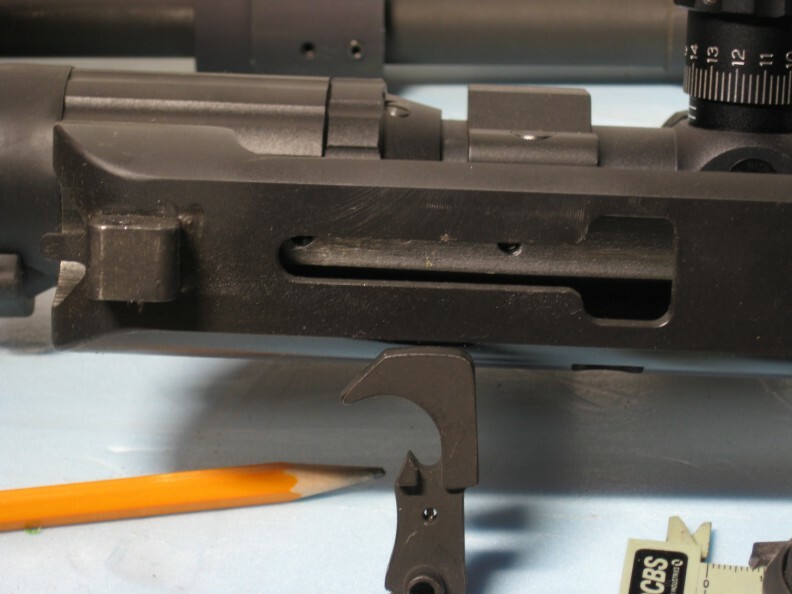 Part of the trigger disconnect tab on the DPMS triggers are wider than.310″ and need to be ground down to allow full travel through the trigger slot on the upper. I used a dremel tool with grinder to grind down the excess material. As the bolt handle is lifted on the Bohica upper it is machined at an angle to cam the hammer back into the locked position. The bolt, in its “as is” machined state has a very sharp edge on it. The hammer, also has an edge on it. The two edges don’t like to slide as needed, rather they tend to cut into each other. The DPMS hammers that we use appear to be a harder material than the bolt cam surface of the Bohica Arms. What we did was radius the interface edges of the hammer and the bolt cam area and polish smooth. It doesn’t take much, but take your time and be CAREFUL. Once the sharp edges were ground down with a dremmel tool, I used 600 grit emery paper to polish the edges smooth. This is no time to be in a hurry. The smoother the edges the smoother the action and the less wear between the two parts. Keep an eye on these parts for wear. As stated in the instruction manual, when you lift the bolt handle, the angled shape of the bolt cams the hammer back. The hammer is very hard material and has an edge at this interface. The machined bolt opening has a sharp edge also. These surfaces must be smoothed out for better action. Action Smoothing: Before you assemble your upper and lower, disassemble the upper and thouroughly clean all the parts. 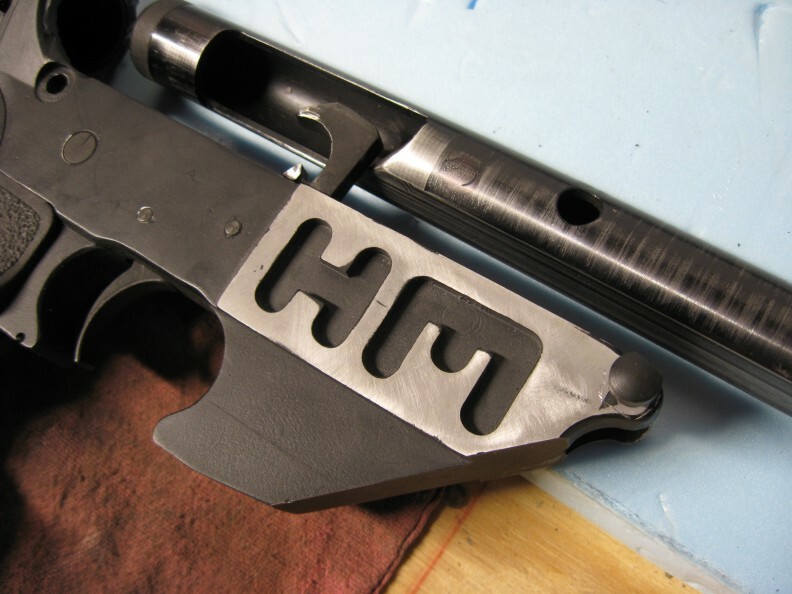 After things are put back together, cycle the bolt in the UNMOUNTED upper. This will show you where any high or rough spots are that may need smoothing out. Doing this WILL REMOVE BLUEING. I used 600 grit emery paper on the bottom of the bolt where the hammer slides, the inside of the receiver, and especially at the rear of the receiver opening. Polish things up, clean up all the parts, put the bolt back in and cycle the action and repeat as you prefer. Once you have the action where you like it, clean the parts, mount the upper WITH OUT the buffer tube. Cycle the action again and see how the bolt cam / hammer interface function as mentioned above. If the interface is not as smooth as you wish, work on it until you are satisfied. The bolt travels back into the buffer extension. There is machining tolerances built into every product made. 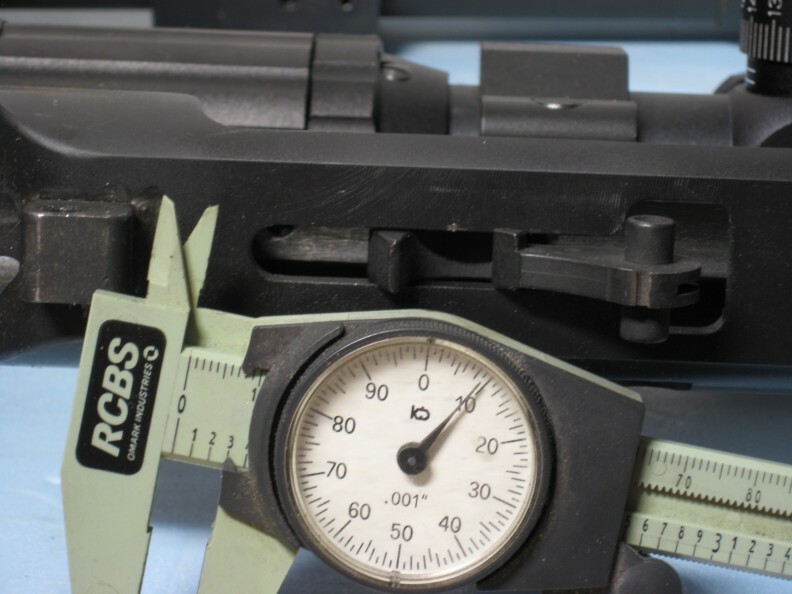 When you assemble your upper and lower, the centerline of the upper bolt hole and the lower buffer extension hole may or may not be in perfect alignment. When the bolt is pulled back on the Bohica upper it travels back into the extension. There may be some interference here. BEFORE you start polishing the interior of the extension tube, cycle action of the uppper itself, unmounted. After you clean up your upper and get a feel for it, when you cycle the action UNMOUNTED, you will get a feel for any rough spots. The blueing will show where things are rubbing together. Take your time and make sure you check this out first. On our two uppers we used some 600 grit emmery cloth to smooth out a couple spots. Once this is smoothed out and cleaned, then mount your upper WITHOUT the buffer tube in place. Cycle the action again. This will tell you if you need to do some work on your Hammer / Bolt cam interface. Once you are happy with this area, then install the buffer tube and cycle the action again. If you have any areas of interference, you can polish as required. One of our uppers was fine here, the other we sanded down the plastic cap on the end of the bolt and polished the buffer tube in the 7:00 position. Bohica is now shipping their new uppers that have addressed these issues. I have not seen one but Chris said he addressed the clearance issues above. 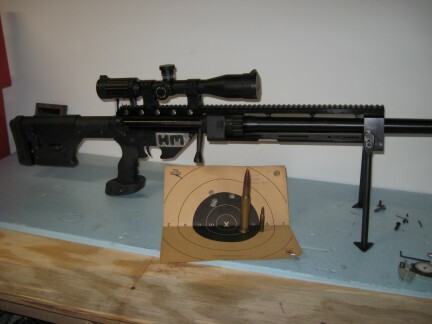 This is my first meeting with the 50 BMG and we have been handloading our own ammo. There are a variety of sources out there for components and we got the majority from Pat’s Reloading. Our test load is 200 gr of 5010 with pulled 690 gr ball and some of the “new” South African stuff. Dad is working on cast bullet loads and we’ll post more on that when we put some data together. We also have a couple things we are experimenting with and will see how they turn out. WARNING: If you have not shot a 50 before with a muzzle break, make sure there are NO INNOCENT BYSTANDERS around when you do. 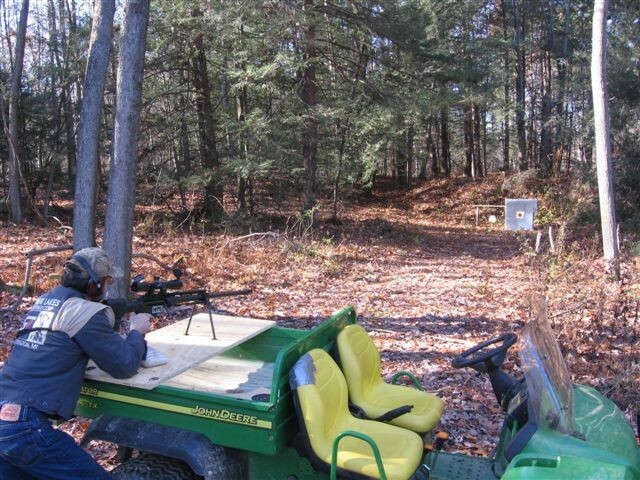 The muzzle blast is nothing to play with and will definetaly get everyone’s attention. Be safe and happy shooting! 1st test rounds after action work and bore sighting. WOW, what a blast !